We analyzed pollen, non-pollen palynomorphs (NPPs), calcareous microfossils, plant macrofossils, diatoms, chrysophyte cysts, opal phytoliths and organic matter content in a 123-cm sediment sequence from Nahuel Rucá Lake, a shallow, freshwater system in the southeastern Pampa grasslands, Argentina. Three stages in the lake evolution were identified. Before 3,680 cal year BP, only pollen, NPPs (dinoflagellate cysts and acritarchs) and ostracods were recovered, suggesting brackish/saline conditions in the lake and nearby areas. Freshwater conditions are, however, indicated by Myriophyllum, Pediastrum and Zygnemataceae. The brackish/saline conditions could have been caused by marine influence during a Holocene sea level high stand that affected the area ca. 6,000 year BP. Between 3,680 and 390 cal year BP, macrophyte pollen and plant macrofossils indicate increasingly freshwater conditions in the lake and the adjacent area. Diatom and ostracod assemblages, however, suggest brackish and oligotrophic conditions, giving way to freshwater and meso-eutrophic conditions toward the end of this period. The relationship between submersed macrophytes (Myriophyllum, Potamogeton, Ceratophyllum, Chara) and planktonic algae (Chlorophyta and diatoms), suggests a shift in the lake from a clear to a turbid state. This turbid state is more evident after 390 cal year BP. High values of Pediastrum, Scenedesmus and diatoms (Cyclotella meneghiniana, Aulacoseira granulata, A. muzzanensis) observed during this stage could have reduced light penetration, with consequent loss of submersed plants. Pollen and plant macrofossils in the uppermost 20 cm indicate a shallow, freshwater lake similar to present, though an increase in brackish/freshwater diatoms suggests an increase in salinity, perhaps related to periodic droughts. Opal phytoliths yield a regional paleoclimatic reconstruction that agrees closely with inferences made using pollen, mammals and sediment characteristics. The Pampa grasslands cover a large area in east-central Argentina. 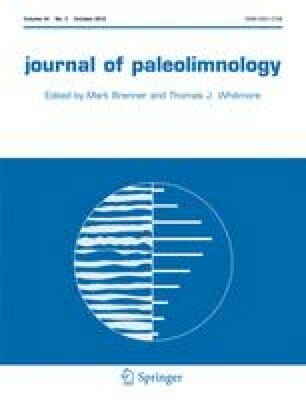 Several studies have provided insights into paleoenvironmental conditions since the Last Glacial Maximum (LGM), using sedimentological and biological proxies (Prieto 1996, 2000; Tonni et al. 1999; Zárate et al. 2000; Prieto et al. 2004). Nevertheless, a detailed environmental history for the Holocene, in particular for the middle-late Holocene, has not been worked out. Lake deposits have great potential as paleoclimate archives (Cohen 2003). Despite the large number of lakes in the Pampa grasslands, about 156,000, ranging in size from 0.05 to >10 ha, few paleoenvironmental studies have been carried out in the region using lake sediments, and studies that have been done usually employed only one climate proxy in the sediment record (Mancini 1994; Stutz et al. 2002, 2006; Borel et al. 2003). In only one case was a multi-proxy approach taken (Fontana 2005), though it is recommended that multiple lines of evidence be used because of the complex interactions throughout lake-drainage basin ecosystems. One approach for generating regionally robust centennial- to millennial-scale interpretations of past climate and environment is to develop multi-proxy reconstructions for a large number of comparable sites. The first challenge is to distinguish between local versus regional patterns of change, and then translate localized responses of individual lakes to the regional scale. Most lakes that occur in the southeastern Pampa grasslands are small and shallow, <500 ha in area and up to ~4 m deep. In such small, shallow systems it is possible that only local changes may be recorded. Thus, a large number of these systems must be studied to obtain a regional picture of past climate and environmental changes. We present results from a multi-proxy study of a shallow, freshwater lake in the southeast region of the Pampa grasslands. We analyzed pollen, non-pollen palynomorphs (NPPs), calcareous microfossils (ostracods and foraminifers), plant macrofossils, diatoms, chrysophyte cysts, opal phytoliths and organic matter content in a sediment sequence retrieved from Nahuel Rucá Lake. The core spans from the late Holocene to the present, and was studied to reconstruct the lake evolution, test whether changes in various climate proxies were synchronous, and explore if the inferred climate changes could be linked to a regional climatic signal. Nahuel Rucá (37°37′S; 57°26′W; 0.60 m deep, 245 ha) is a shallow, freshwater lake in the southeast region of the Pampa grasslands, Buenos Aires Province, Argentina (Fig. 1). The study site, like most lakes in the region, is a deflation basin situated on the windward side of paleodunes. These basins and associated paleodunes were probably formed by prevailing westerly winds during the late Pleistocene (Tricart 1973). With the onset of moister Holocene conditions (Prieto 1996, 2000; Zárate et al. 2000), these depressions probably became areas of groundwater discharge and surface water accumulation, filling gradually with sediment, but subject to episodic droughts. Nahuel Rucá Lake is associated paleoecologically with two sites, the Mar Chiquita coastal lagoon and Hinojales Lake (Fig. 1), because the entire area was affected by sea level fluctuations during the Holocene. The regional model of sea-level fluctuations, from Tierra del Fuego, Argentina to Salvador de Bahia, Brazil, proposes that after the Late Glacial Maximum, sea level rose rapidly, exceeding the modern level by 7,500–7,000 year BP. Between 6,500 and 5,500 year BP, sea-level reached its maximum high stand, which was followed by a progressive fall before it reached its modern position (Isla 1989). For the study area in particular, Violante et al. (2001) established that sea level reached a maximum of 2.0–2.5 m a.s.l. between ca. 6,000 and 5,500 year BP. A Pleistocene paleocliff west of the Mar Chiquita coastal lagoon constitutes a relict of the late Pleistocene transgression and marks the limit of Holocene transgression. During the maximum sea-level stand, however, the sea surpassed this barrier in some zones and reached the shallow freshwater lakes and depressions behind it (Violante 1992; Stutz et al. 2006). During the regressive phase, an estuarine environment and a sandy barrier developed east of the Pleistocene paleocliff, and areas landward of these landforms evolved into modern shallow, freshwater lakes. The modern regional vegetation of the study area is characterized by several genera of grasses. It lacks trees and the landscape is used intensively for agriculture and grazing. The local vegetation is characterized by sedges (Cyperus, Carex, Schoenoplectus, Eleocharis), grasses (Paspalum, Stipa, Panicum, Polypogon, Glyceria, Paspalidium), and several species of Juncus and herbaceous dicots (Eryngium, Aster, Daucus, Phyla) (Vervoorst 1967). The lake plant community is characterized by several species of emergent, floating and submersed macrophytes. The dominant species is the emergent taxon Schoenoplectus californicus which forms a complete ring around the lake. Other emergent macrophytes grow into the ring of Schoenoplectus in the shallowest zones: Zizaniopsis bonariensis, Hydrocotyle bonariensis, H. ranunculoides, Alternanthera philoxeroides, Solanum glaucophyllum, Bacopa monnieri, Polygonum punctatum, Ranunculus apiifolius, Triglochin striata and Phyla canescens. Near the shore, Ricciocarpus natans (a liverwort), Azolla filiculoides (a fern), Lemna valdiviana and Wolfiella lingulata form a dense carpet. Myriophyllum elatinoides and Ceratophyllum demersum develop in the deepest parts of the lake, but are also found near shore where there is no other vegetation. The climate of the area is temperate, with annual mean temperature and precipitation of 13.8°C and 941 mm, respectively (Mar del Plata Aero meteorological station, 37°33.6′S, 57°21′W, Servicio Meteorológico Nacional). Mean temperature varies from 20°C in January to 7.3°C in July. Rainfall occurs mainly from spring (September) to autumn (March), with a maximum of 112 mm in February and a minimum in August (45 mm). During summer, winds are predominantly from the N, NE and E directions, but from the NW or SW in winter. A 123-cm-long core was recovered from the deepest part of the lake (0.60 m) with a 7-cm-diameter vibracorer, in October 2003 (Fig. 1). In the laboratory, the core was described and sectioned at contiguous 1-cm intervals. Subsamples were analyzed for: (1) organic matter content, (2) pollen and non-pollen palynomorphs (NPPs), (3) calcareous microfossils (ostracods and foraminifers) and plant macrofossils, and (4) diatoms, chrysophyte cysts and opal phytoliths. Samples of 1–5 g sediment were taken at 2–5 cm intervals for determination of organic matter content and samples of 2.5–30 g at 2–4 cm intervals for analysis of calcareous microfossils and accompanying biota. Pollen, NPPs and siliceous remains were analyzed at 1–2 cm intervals. Lithologic description was based on visual inspection (A Prieto, pers. commun.). Three AMS 14C dates were determined on Heleobia parchapii shells and Schoenoplectus californicus achenes (Table 1). Radiocarbon ages were calibrated against the Southern Hemisphere curve (SHCal04) (McCormac et al. 2004) using the program CALIB 5.0.1 (Stuiver et al. 2005). In view of the fact that there are few dates, core stratigraphy and biological proxy diagrams were plotted against depth and calibrated ages are indicated to the left of each diagram. Organic matter content was estimated by weight loss-on-ignition (LOI) at 550°C for two hours and is expressed as a percent of dry weight (Heiri et al. 2001). Samples for pollen and non-pollen palynomorph analysis were prepared following standard techniques, using warm KOH, warm Na4P2O7, HCl, heavy-liquid separation with ZnCl2, HF and acetolysis (Faegri and Iversen 1992). Two Lycopodium clavatum tablets were added before treatment. At least 300 pollen grains, including terrestrial and aquatic vascular taxa, were counted for most samples, except samples from 92, 93 and 94 cm depth, in which pollen concentrations were extremely low. Each pollen type was calculated as a percent of the total pollen sum (terrestrial and aquatics). NPPs were calculated as a percent of the pollen sum plus NPP sum. Percentages of Azolla filiculoides, Ricciocarpus natans and Bryophyta were calculated as percentages of the pollen sum plus spores sum. Identifications of pollen grains, spores and NPPs were made using atlases and published keys (Markgraf and D’Antoni 1978; Borel et al. 2003; Borel 2007) and the reference collections of the Laboratory of Paleoecology and Palynology, UNMdP, and Laboratory of Palynology, UNS. Pollen zones were defined using CONNISS (Grimm 1987) on pollen types with ≥2% of the total in at least one sample. Calcareous microfossils (ostracods and foraminifers), plant macrofossil remains and accompanying biota were first sieved through 180- and 63-μm mesh without chemical treatment. Charophyte oospores, seeds, megaspores and Cladocera ephippia were recovered from the 180-μm sieve. Material retained on the sieves was treated with hot dilute hydrogen peroxide, sieved through 250-, 125- and 63-μm mesh and dried. Ostracods, foraminifers and charophyte gyrogonites were recovered from these fractions. Ostracod nomenclature follows Martens and Behen (1994) and Whatley et al. (1997). Zones were defined numerically using optimal splitting techniques (Bennett 1996). Vascular plant nomenclature follows the catalogue of the Argentine flora published online by the Darwinion Institute (1997–2008) (http://www.darwin.edu.ar/Proyectos/FloraArgentina/FA.asp). Samples for diatoms, chrysophyte cysts and opal phytolith analyses were treated with 35% HCl for 24 h to remove carbonates, and rinsed four times with distilled water. To eliminate organic matter, 10 ml of 30% H2O2 were added, and samples were boiled for 4 h and rinsed five times with distilled water. Permanent slides were mounted in Naphrax® for counting and identification. At least 300 diatoms, and usually >350, were counted. Chrysophyte cysts were counted along with diatoms and expressed as a percent of their abundance relative to the total number of diatom valves and chrysophyte cysts (Karst and Smol 2000). Diatoms were identified according to Frenguelli (1941, 1945) and Metzeltin et al. (2005). Information on the environmental requirements and habitats of diatoms was taken from Frenguelli (1941, 1945), Metzeltin et al. (2005) and Hassan et al. (2006). Diatom zones were defined using complete linkage Stratigraphically Constrained Cluster Analysis using the program PAST 1.81 (Hammer et al. 2008). The Morisita Index was used to assess the strength of the association among diatom assemblages. A minimum of 200 phytoliths was counted at 1,000× magnification in each sample. Phytoliths were identified according to Bozarth (1992), Twiss (1992), Fredlund and Tieszen (1994), del Puerto (2009), and using the reference collection of the Faculty of Sciences, UdR. Although phytoliths cannot be assigned to individual grass taxa, ratios of phytolith types (pooid, chloridoid and panicoid) can be used as climate indicators. Taxonomic problems in grass phytolith classification derived from multiplicity, i.e., the same plant produces different phytolith forms, and redundancy, i.e., the same phytolith form is produced by different plant taxa (Rovner 1992). Nevertheless, when phytolith investigations are not used solely to identify grass taxa, but rather to assess the relationship between phytolith assemblages and grassland composition, the morphotype classification system is both taxonomically and environmentally sensitive (Fredlund and Tieszen 1994). del Puerto et al. (2006) address other problems with respect to taxonomic identification of opal phytoliths in the South American Pampa grasslands. Because the grasses of southern Uruguay and eastern Argentina are similar, the reference collection of phytoliths of del Puerto et al. (2006) can be used for phytolith identification in the area of Nahuel Rucá Lake. Despite such problems as multiplicity and redundancy, the Twiss classification of grass phytoliths was shown to be a reliable tool for inferring paleoclimate changes and has been tested using multi-proxy approaches (Fredlund and Tieszen 1997; Alexandre et al. 1999; Baker et al. 2000; Bracco et al. 2005b). High index values suggest a cool climate, comparable to high latitudes or altitudes where C3 grasses are prevalent, and low index values suggest warm temperatures, characteristic of low latitudes or elevations. Opal phytolith analyses carried out on surface sediment samples from cattle/sheep enclosures, with the aim of obtaining a record of present climate conditions, yielded Temperature Index (TI) values between 48 in NW Uruguay and 60 in SE Buenos Aires Province, Argentina (del Puerto 2009). High index values indicate an arid climate, while low values indicate a humid climate. Opal phytoliths in surface deposits of cattle/sheep enclosures registered Humidity Index (HI) values between 10 in southern Uruguay and 16 (SE Buenos Aires Province) for Pampa grasslands (del Puerto 2009). Opal phytolith zones were defined using complete linkage Stratigraphically Constrained Cluster Analysis using the program PAST 1.81 (Hammer et al. 2008). The Morisita Index was used to assess the strength of the association among phytolith assemblages. The LOI, pollen and NPPs, diatom and phytolith diagrams were created using TGView 2.0.2 (Grimm 2004), while Psimpoll 4.26 software (Bennett 2008) was used for the diagram of calcareous microfossils and accompanying biota. The sediment core was divided into seven lithologic sections (Figs. 2, 3, 4, 5). The lowermost sediments consist of silty sand with calcrete concretions (123–118 cm) overlain by clay-rich sediments (118–86 cm). Samples from these two sections were sterile or yielded only low amounts of plant or animal remains. LOI values were <10% in these lower sediment units (Fig. 2). Organic matter content increased between 75 and 62 cm, reaching values up to 40%. Above 62 cm, LOI values decreased, first sharply and then more gradually to 5% at 40 cm, and then rose towards the top, where LOI values reached 35%. Pollen and NPPs were analyzed from 94 cm to the top (Fig. 2). Four Pollen Association Zones (PAZ) were distinguished. PAZ1 (94–88 cm) is characterized by maximum values of Chenopodiaceae, accompanied by Cyperaceae and Poaceae. Asteroideae, Ambrosia, Myriophyllum and other herbs occur in low percentages. Among NPPs, the spectra are characterized by Pediastrum and maximum values of Zygnemataceae zygospores, Peridinium cysts, Cobricosphaeridium, and Acritarch sp. F.
PAZ2 (88–53 cm) is characterized by maximum values of Myriophyllum, increasing values of Cyperaceae and decreasing values of Poaceae and Chenopodiaceae. Potamogeton reaches highest values in the sequence. Low quantities of Asteroideae (≤15%), Apiaceae and Ambrosia (≤10%) are registered. Pediastrum exhibits maximum values (>60%), also Desmidiaceae (up to 45%), Gloeotrichia (up to 25%) and Botryococcus (up to 10%). Peridinium cysts and Cobricosphaeridium register decreasing values. Ceratophyllum is present, with values up to 10%. PAZ3 (53–15 cm) is characterized by Cyperaceae and Poaceae, with maximum values of up to 35%, accompanied by Chenopodiaceae, Ambrosia, Asteroideae and Apiaceae. Pollen percentage values of the macrophytes Lemnaceae, Bacopa, Alternanthera, Ranunculus, Phyla and Triglochin are low, but constant in this zone. Values of Azolla filiculoides and Ricciocarpus natans increase to the top of the zone. With respect to NPPs, the zone is characterized by Pediastrum and maximum values of Scenedesmus, up to 35%. PAZ4 (15–0 cm) is characterized by maximum values of Cyperaceae and Lemnaceae, accompanied by Poaceae, increasing values of Myriophyllum and Chenopodiaceae and Ambrosia. In addition, Azolla filiculoides reaches maximum values. The NPP proportions of Gloeotrichia and Ceratophyllum increase, while Pediastrum and Scenedesmus abundances decrease. The calcareous microfossils (ostracods and foraminifers), charophytes and plant macrofossils recovered are summarized in Fig. 3. A few specimens of Limnocythere cf. staplini were encountered at the base of the sequence, below 88 cm, but were not considered in zonation of the diagram. The sequence was divided into four Calcareous Microfossil Association Zones (CMZ). CMZ1 (88–72 cm) contains the highest concentration and diversity of fossils. The zone is mainly dominated by oospores and gyrogonites of Chara, which reach their maximum values in the sequence. The ostracod assemblage is dominated by Limnocythere cf. staplini, accompanied by Cyprideis salebrosa, Heterocypris cf. incongruens, Cypridopsis vidua and Sarscypridopsis aculeata and a few specimens of Candonopsis and Chlamydotheca incisa. Among the plant macrofossils, Myriophyllum mericarps and Potamogeton, Schoenoplectus, Chenopodium and Zannichellia palustris seeds were the most abundant. CMZ2 (72–60 cm) is dominated by plant macrofossil remains, with especially high quantities of Schoenoplectus and Chenopodium seeds and Myriophyllum mericarps. CMZ3 (60–24 cm) contains a high diversity, but low quantity of fossils. Azolla filiculoides megaspores, Chara and Nitella hyalina oospores, Daphnia ephippia and ostracods like Limnocythere cf. staplini and Heterocypris cf. incongruens are the most frequent remains within this zone. CMA4 (24–0 cm) is dominated by plant macrofossils, Azolla filiculoides megaspores and minor quantities of Lemna and Chenopodium seeds. Seventy-four diatom species were identified throughout the sediment core. No valves were preserved below 82 cm. The most abundant species (>2% in at least three samples) are shown in Fig. 4. Four Diatom Association Zones (DAZ), were identified. DAZ1 (82–69 cm) is dominated by Aulacoseira granulata var. angustissima and A. granulata. Co-dominant species include Campylodiscus clypeus, Cyclotella meneghiniana, Epithemia adnata, Surirella striatula, Caloneis formosa, and Hyalodiscus subtilis. The basal sample of this DAZ exhibits a high ratio of cysts to diatoms, which decreases upwards. In the upper section, a sharp increase in abundance values of A. granulata var. angustissima is observed, together with a sharp decrease in cyst/diatom ratio. DAZ2 (69–55 cm) is dominated by Cyclotella meneghiniana and Epithemia adnata (45%). Co-dominant species are Aulacoseira muzzanensis, A. granulata and Fragilaria capuccina. A decrease in cyst/diatom ratio is recorded. However, towards the upper section of this DAZ, cyst/diatom ratio increased. DAZ3 (55–21 cm) is characterized by a sharp increase in the relative abundance of Aulacoseira granulata, accompanied by A. granulata var. angustissima, A. muzzanensis and Cyclotella meneghiniana. The cyst/diatom ratio decreased. DAZ4 (20–0 cm) exhibits the highest relative abundances of Epithemia adnata, Cocconeis placentula, Rhopalodia gibberula, together with Aulacoseira granulata and Cyclotella meneghiniana. The cyst/diatom ratio continues to decrease within DAZ 4, except for the surface sediment sample, in which the cyst/diatom ratio increases. Opal phytoliths were found only in the upper 104 cm of the sediment core (Fig. 5). Below 83 cm depth, phytoliths were scarce and showed signs of corrosion and fragmentation. Eight Opal Phytolith Association Zones (OPAZ) were identified. OPAZ1 (104–83 cm) is characterized by dominance of grass phytoliths, mainly short cells of C3 species from the Pooidae subfamily (particularly Avenae and Poeae tribes), although arundinoid morphotypes were also observed. There was low abundance of C4 cells, with more panicoid (Paniceae and Andropogoneae tribes) than chloridoid phytoliths. Temperature index values indicate conditions colder than present and humidity index values display high variability. In addition to grass phytoliths, globular echinate phytoliths, produced by Arecaceae (palms), were found in OPAZ1. In the upper section of this zone, Cyperaceae phytoliths and abundant phytoliths from woody dicots (probably shrubs) were identified. OPAZ2 (82–74 cm) is characterized by a sharp decrease in pooid and arundonoid phytoliths and an increase in panicoid and aristidoid phytoliths. Cyperaceae are also abundant in this zone. Temperature and humidity indices suggest increases in both temperature and humidity towards the top of this zone. OPAZ3 (72–58 cm) displays an intensification of the trend observed in the former section and maximum values of panicoid and minima of pooid phytoliths yielded minimum values of both temperature and humidity indices. Maximum abundances of Cyperaceae are also registered in this zone. OPAZ4 (56–54 cm) represents a further increase in pooid phytoliths and a decrease in panicoid phytoliths. High abundance of sedges and low numbers of woody dicot phytoliths also characterize this zone. OPAZ5 (52–44 cm) is defined by a decrease in both pooid and chloridoid phytoliths and by an increase in panicoid and arundinoid phytoliths. This implies a decrease in both temperature and humidity indices. Low abundances of sedges and woody elements are also observed. OPAZ6 (42–20 cm) is marked by decreases in panicoid and arundinoid phytoliths, together with an increase in pooid phytoliths. There is also an increase in abundance of aristidoid phytoliths, while chloridoid types vary. Toward the top of this zone, there is an increasing trend in the temperature index, while the humidity index shows high variability. Cyperaceae and woody dicots also increase. OPAZ7 (18–15 cm) is characterized by an increase in arundinoid phytoliths, together with a decrease in both pooid and panicoid cells. There is also a decrease in sedges and woody dicots. Humidity and temperature indices show similar values to those at the top of the underlying OPAZ. OPAZ8 (13–0 cm) is characterized by pooid dominance, followed by rundinoid and panicoid phytoliths. Chloridoid and aristidoid phytoliths show similar values, and other groups of grass cells display lower values. In addition to grass cells, sedges show values similar to those of aristidoid phytoliths, while trees and shrubs exhibit lower values. Temperature and humidity indices show decreasing values compared to the former zone. There are potential problems with the chronology of the Nahuel Rucá core. The first issue is potential hard-water-lake effect that could cause radiocarbon dates on shells to be too old. A study in a similar ecosystem of the southwestern Pampa grasslands, however, demonstrated there was no effect on dated Heleobia parchapii shells (Fontana 2007). Ideally, such an evaluation should be done on each system studied. Nevertheless, we accepted the radiocarbon age of 3,680 year cal BP (3,480 ± 40 14C). If all radiocarbon dates are correct, the uppermost 72 cm of the core represent ~740 cal year of accumulation. The underlying 10–11 cm are separated by 2,940 cal year (i.e., dates of 740 and 3,680 cal year), and the bottommost 40 cm are older than 3,680 cal year. We have no simple explanation for the long period of time, ~2,900 years, represented by the interval between 83 and 72 cm. The core displays a lithologic change at 75 cm, with an increase in organic matter content. One possible explanation for the apparent slow sedimentation rate is an unconformity due to an erosional event in the past, followed by the onset of sedimentation of a different type of material. A similar process may have also occurred in other ecosystems in the region, e.g., Lakes Tobares and Lonkoy (Stutz unpublished data). Despite a paucity of radiocarbon dates it is possible to suggest a tentative chronology for the stratigraphic shifts in paleoenvironmental indicators, which allows a comparison with other late Holocene records from the region. Simultaneous changes in pollen, NPPs, diatoms, opal phytoliths, ostracods and plant macrofossils, reveal five main stages in the lake evolution. Prior to 3,680 cal year BP, phytoliths, pollen and NPPs and ostracods valves were recovered, although in low concentration. Pollen spectra, dominated by Chenopodiaceae, suggest a halophytic plant community grew in the surrounding area. Among the NPPs, Pediastrum, Botryococcus and Zygnemataceae zygospores, together with submersed Myriophyllum, indicate a freshwater lake. On the other hand, brackish to saline conditions can be inferred from Cobricosphaeridium (copepod or anostracod eggs; Head et al. 2003), Peridinium cysts and Acritarch sp. F (possible cysts of prasinophycean algae; Borel 2007), as well as the presence of the ostracod Limnocythere cf. staplini. The brackish/saline conditions in Nahuel Rucá Lake could have been the result of the intrusion of seawater into the former freshwater lake during the maximum Holocene sea level stand, as occurred in contiguous shallow Lake Hinojales, where ca. 4,710 cal year BP, pollen spectra indicate a halophytic plant community, and diatom, ostracod, microforam, mollusk and NPP assemblages indicate a brackish/saline influence in the fresh water body (Stutz et al. 2002, 2006; Borel et al. 2003). This NPP assemblage, associated with Ruppia, was also registered in some southwestern Pampa grassland creeks, Claromecó, Las Brusquitas and La Ballenera (Stutz et al. 1999; Vilanova et al. 2006; Borel 2007), indicating brackish conditions in the water bodies and marsh environments that developed by ca. 6,200–5,500 cal year BP during the Holocene sea level high stand. In Negra lagoon, southeastern Uruguay, the same NPPs and pollen spectra are recorded during the period when the lagoon was open to the sea (Garcia-Rodriguez et al. 2010). Between 3,680 and 740 cal year BP, freshwater conditions apparently dominated Nahuel Rucá. According to Scheffer (1998), maximum values of both pollen and plant macrofossils of the submersed macrophytes Myriophyllum, Potamogeton, Ceratophyllum and Chara suggest a clear water body with considerable light penetration. This interpretation is supported by low abundances of planktonic algae, including Pediastrum, Scenedesmus and Botryococcus, although Aulacoseira granulate, var. angustissima, a freshwater planktonic diatom, displays highest values, up to 50%. Scheffer’s concept postulates that shallow lakes may possess two alternative states: a clear-water phase, with high water transparency, low phytoplankton biomass and predominance of macrophytes, and a turbid state, with low transparency, high phytoplankton biomass and low abundance of macrophytes (Scheffer and Jeppesen 2007). Paleolimnological data have been used to track alternative states of shallow lakes (Karst and Smol 2000; García-Rodríguez et al. 2004). Even though sea level was beginning to decrease toward its present position, and pollen and NPP spectra show decreasing values of Chenopodiaceae and Peridinium cysts, ostracod and diatom spectra still show elements that suggest brackish conditions in the water body. DAZ1 exhibits the highest values of Campylodiscus clypeus and other less abundant marine/brackish species such as Surirella striatula and Caloneis formosa. The components of the ostracod assemblage, Limnocythere cf. staplini, Cyprideis salebrosa, Heterocypris cf. incongruens and Sarscypridopsis aculeata, are characteristic of brackish, shallow-water environments, and indicate an oligotrophic, alkaline water body, with low phosphorus content and ph above 6. The dominance of Limnocythere cf. staplini could also indicate high-salinity conditions. The presence of foraminifers suggests close proximity to the sea. Among the opal phytoliths, those of Cyperaceae begin to increase around this time, indicating the re-establishment of freshwater conditions. Nutrient-limited growth conditions, together with good light availability, may explain the higher frequencies of Gloeotrichia (PAZ2). The cyanobacteria have a competitive advantage over other taxa by virtue of their N2-fixing capability, but nitrogen fixation demands a large amount of energy and consequently requires high light availability in relatively shallow water (van Geel et al. 1996). Between 740 and 390 cal year BP, pollen of Myriophyllum and Potamogeton decrease slightly, though macrofossils (mericarps and seeds) of these submersed macrophytes remain almost constant (CMZ2). At the top of PAZ2, planktonic algae Pediastrum and Desmidiaceae reach highest values and Scenedesmus increases, indicating a shift to a turbid state. The diatom spectra also show increasing values for freshwater planktonic species (e.g., Cyclotella meneghiniana). Increased planktonic microalgae populations could have reduced light penetration, with the consequent loss of Chara beds on the lake floor. Myriophyllum and Potamogeton can tolerate much more turbidity than charophytes (Blindow et al. 2002). This shift from a clear to a turbid state is also reflected in the changing ratio between cysts and diatoms, which indicates trophic state variability. According to García-Rodríguez (2006) trophic state is higher when cyst/diatom ratios are lower. Ostracod assemblages (CMZ2) also indicate trophic state variability, with mesotrophic to eutrophic conditions (high phosphorus and nitrate content, and ph ≥ 7). Maximum values of shoreline and emergent macrophyte remains, specifically Schoenoplectus and Chenopodium seeds, indicate near-shore conditions and thus low lake levels. Maximum values of organic matter content (up to 40%) were observed during this episode. Opal phytoliths of Cyperaceae display maximum values. After 390 cal year BP, freshwater meso-eutrophic planktonic species accounted for approximately 90% of the relative abundance, suggesting an increase in trophic state. This is also supported by the decrease in cyst/diatom ratios, as observed in DAZ2. Maximum values of Aulacoseira granulata occur coincident with maximum values for the planktonic chlorophycean Pediastrum and for Scenedesmus, and minimum values for Myriophyllum. This suggests that the lake was turbid during this period. Increasing values for floating Azolla filiculoides (micro and macro spores) and Ricciocarpus natans, which form a dense cover on the surface of the modern lake, could have also contributed to reduced light penetration. The increase in pollen percentages of emergent macrophytes, Bacopa, Alternanthera, Ranunculus, Polygonum, Phyla canescens and Triglochin indicate conditions similar to those in the modern lake. Low numbers of calcareous microfossils and plant remains in this section, together with a high abundance of gastropod shell fragments, suggests sediments were deposited under high-energy conditions. The top 20 cm of the core are interpreted to represent modern lake conditions. The pollen spectra reflect the modern plant community, dominated by Schoenoplectus (Cyperaceae) accompanied by Myriophyllum and a dense carpet of Lemnaceae (Lemna, Wolfiellla), Azolla filiculoides and Ricciocarpus natans. Although plant macrofossils, pollen and NPP spectra indicate freshwater conditions, the increase in brackish/freshwater diatom species, together with a decrease in freshwater taxa, suggests that the system might have increased in salinity. This is also supported by the decrease in cyst/diatom ratios (García-Rodríguez 2006). Pulses of increased brackish conditions could be the consequence of episodic droughts that have affected this part of the Pampa grasslands over last 150 years (Deschamps et al. 2003). The dense carpet of free-floating species could have reduced light penetration and dissolved oxygen concentration in the water column, causing the loss of submersed aquatic plants by shading and subsequent anoxia. Increases in pollen of Myriophyllum and leaf-spines of Ceratophyllum, accompanied by a slight decrease in planktonic algae, chlorophytes, and diatoms, suggests re-colonization by these plants, with a consequent change in light penetration. Furthermore, the increase of Gloeotrichia in this zone may reflect greater energy available for nitrogen fixation by these cyanobacteria, as a result of higher light intensity. The proxies analyzed in the Nahuel Rucá Lake core reflect primarily changes in lake evolution. To infer past climate changes it is necessary to translate local responses from several sites to the regional scale. Analysis of opal phytoliths was used to calculate temperature and humidity indices, which can be used to infer paleoclimate changes. The paleoclimate interpretations are based on phytoliths and are compared with information provided by others lines of evidence, i.e., pollen, faunal assemblages, and sedimentology from aquatic ecosystems and archaeological sites of the Pampa grasslands. High values of temperature and humidity indices indicate conditions cooler than today with episodes of aridity or seasonal rainfall during the transition from the middle to the late Holocene, before ca. 3,700 cal year BP. This is in agreement with the model based on sedimentological records (Iriondo and Garcia 1993), that suggests a change from warm and perhaps more humid conditions to a semi-arid phase at the beginning of the late Holocene. Despite the fact that paleoclimate data for the late Holocene in the Pampa grasslands are fragmentary, and in some cases controversial, many authors agree that after ca. 5,000 year BP, climate became drier, with short episodes of semiarid or humid and warm conditions (Zárate et al. 2000; Prieto et al. 2004; Mancini et al. 2005; Quattrocchio et al. 2008). The development of characteristic dry pampa grasslands suggests regional sub-humid to dry conditions (Prieto 1996), while faunal assemblages suggest semi-arid conditions with temperatures slightly higher than modern ones (Tonni et al. 1999). In the SE Pampa grasslands, a temperate climate at ca. 3,000 cal year BP, with probable further increases in dryness and seasonality during the late Holocene, is inferred from diatoms (Bonomo et al. 2009). Declines in the temperature and humidity indices suggest climatic conditions warmer and more humid at the beginning of the late Holocene, after 3,700 cal year BP, than in the previous period. The maximum values attained by ca. 740 cal year BP indicate an episode of cooler and drier conditions. The change to warmer and wetter conditions similar to present times was also inferred from opal phytolith records from southeastern Uruguay (Castillos and Negra Lakes) after ca. 2,000 cal year BP. At Negra Lake, these conditions were followed by a dry and cold event (Bracco et al. 2005a, b; del Puerto 2009). Mammal assemblages from the southern Pampa grasslands suggest a transition from humid to arid conditions between 2,000 and 500 14C year BP (Tonni et al. 1999; Prado and Alberdi 1999). Quantitative precipitation reconstructions based on pollen sequences showed precipitation values 100 mm greater than modern values between 2,000 and 500 cal year BP, suggesting sub-humid to dry conditions for the southwest Pampa grasslands, while sub-humid to humid conditions similar to modern were inferred for the central area (Tonello and Prieto 2010). These precipitation reconstructions coincide with the positive humidity index values based on phytoliths at Nahuel Rucá Lake. Therefore, warm and humid conditions would have represented a mosaic of microhabitats. During the last 400 cal year, the temperature and humidity indices indicate a decrease in temperature and a highly variable hydrologic regime. These conditions are also registered by faunal assemblages from the Pampa grasslands (Tonni et al. 1999) and by paleolimnological records from southern Uruguay (Bracco et al. 2005b), and have been associated with the Little Ice Age, which is generally thought to have occurred between 400 and 150 cal year BP (Bradley et al. 2003; Villalba et al. 2005). At Nahuel Rucá Lake, however, cold and fluctuating humid-dry conditions persisted until the present. Inferred precipitation values decrease during the last 500 cal year in the southwest Pampa grasslands, suggesting semi-arid climate conditions (Tonello and Prieto, 2010). Historic chronicles and geomorphologic data indicate arid conditions in post-Hispanic times, with intervals of increased precipitation (Tonni et al. 1999; Deschamps and Tonni 2007). Short-term fluctuations in climate during this last interval may have been sufficient to initiate changes in the water bodies, with a general reduction in the lake volume, but intermittent periods of flooding. The evolution of shallow Nahuel Rucá Lake during the late Holocene was reconstructed using seven sources of paleoecological information: pollen, NPPs, calcareous macrofossils (ostracods and foraminifers), plant macrofossils, diatoms, opal phytoliths and organic matter. There was a close correspondence in the timing of assemblage changes for all biological proxies in the core. These proxies explain the history of the lake evolution. Paleoclimate was inferred from opal phytoliths and results are in agreement with other Holocene paleoclimate reconstructions from the region that utilized pollen, faunal assemblages, and sedimentology as proxies. Prior to 3,680 cal year BP, a shallow, freshwater lake with marine influence developed. After the onset of full freshwater conditions, two stages can be recognized in the evolution of the lake: (1) between 3,680 and 740 cal year BP, a clear state, dominated by macrophytes, and (2) a subsequent turbid state dominated by planktonic algae. This study sheds light on the Holocene sea level history of the region, and established that sea level reached areas beyond the Pleistocene paleocliff, as in shallow Hinojales Lake (Stutz et al. 2002, 2006). The multi-proxy approach we used here must be extended to other shallow lakes in the area to obtain data for regional paleoclimate and paleoenvironment models. We thank P. Urrutia for giving us permission to work on his property, and A. González, M. Hernandez, I. Vilanova for their support during coring activities. F. I. Isla kindly lent us the vibracorer and T. Giesecke provided valuable comments on an early version of the manuscript. We thank the (NSF)-Arizona AMS Facility and T. Jull for financial support for dating. We thank Mark Brenner and two anonymous reviewers for helpful comments. Mark Brenner kindly corrected the English. Financial support was provided by PICT No. 32345 (ANPCyT) and EXA 384/07 (UNMdP).